URL shorteners are increasing in popularity. This is because increasing numbers of people want to create a short URL for Twitter and other micro blogging and social networking sites while maintaining visibility of their brand or blog name. 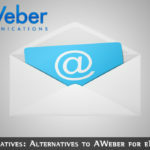 Several forward-thinking companies and website owners are succeeding in getting their shortened URLs recognized synonymously with their full domain names. They have achieved this by creating a customized short URL by means of their own or certain commercial URL shorteners. At our tech blog TechLila, we have used such methods to generate the short URL techli.la which we can use when longer URLs would be changed to a random set of figures. By doing this, we can retain our branding in Twitter links and other microblogging systems where our brand would otherwise not have been visible. Here are some of the benefits of using URL shorteners that help you maintain your branding in the shortened version. Customized short URLs not only help you promote your brand but are also less liable to be mistyped. TinyUrl provides randomly generated names that are difficult to remember and easily mistyped. The URL looks cool and related to your business: it can also contain the important elements of your full domain name. They maintain your branding in tweets and other micro-blogging posts where your URL would otherwise be a meaningless combination of letters and numbers. Because they are open source, such customizable URL shorteners are free and are more likely to endure than commercial services, many of which have disappeared. Although free, some such services can provide traffic details relating to the shortened URL. When you shorten a URL using commercial services such as TinyUrl, some networks such as schools and colleges will block them. 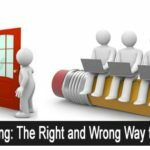 That is because they are known ways to hide the URLs of pornographic, online gambling and other illegal and unsavory websites. Here is a review of two of these currently being used to create a customized short URL for Twitter or any other micro-blogging services: YOURLS and Bit.ly. Bit.ly enables you to point short domain names of your choice to your regular website. You can choose a custom short name when you use this method. First choose a small URL: you can use your favorite domain finder for this such as Domainsbot or Domainr. Let’s say you have a site connected with the European Union or currencies. 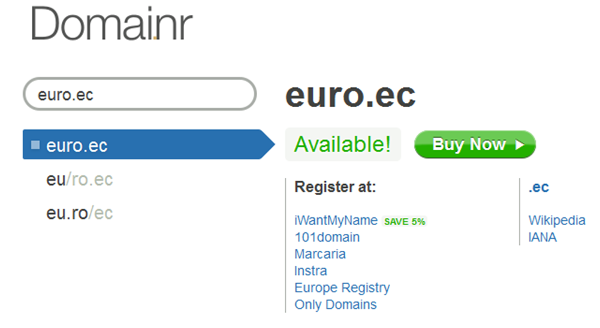 Using Domainr we found this domain available: euro.ec – the screenshot below shows that is was available at the time. 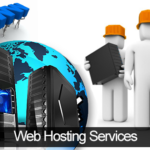 Once you have found a domain you must first register it using a service such as GoDaddy, gandi.net or ENOM. It is important that the name you select is less than 15 characters, or it will not work with bit.ly. Go to the Bit.ly website and register for the Pro beta account – this is free to join and enables you to use your own short URL. Just like any other domain name, you have to register the domain name to point to a hosting service. The vast majority of domain name providers, such as GoDaddy, gandi.net or ENOM, make this very easy to do, so follow the instructions on the site you use. With GoDaddy, for example, look for the ‘A Record’ (Address Record) under the tab marked ‘Total DNS.’ This record maps the domain name to a specific IP address. Each domain name service can handle this in a different way, but if you have any problems the support will keep you right. With GoDaddy, you find the appropriate box, add the DNS record and enter the Bit.ly IP address in the box provided. The IP address to use is IP 168.143.174.97. A few people are unsure about this part, so contact GoDaddy support, or the support service of the domain name registration service you have used, and they will make sure you do it correctly. There is, however, plenty information on the site on how to do this. Go to your Bit.ly Pro account and enter the short URL of your blog (the shortened version). Then follow instructions to verify ownership of the blog or website. 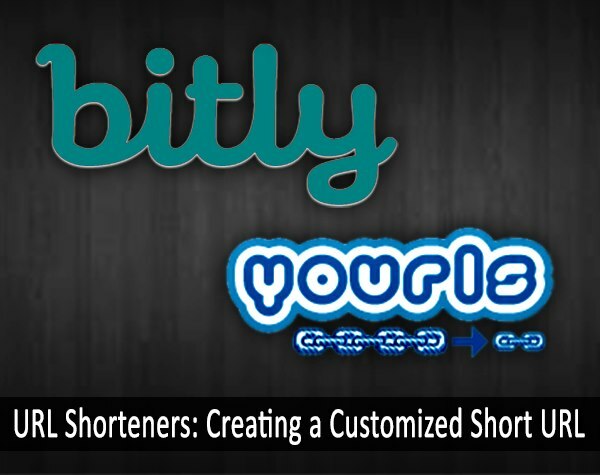 Now, any links shortened from Bit.ly will be converted to the custom short URL you have entered. Any URL that you shorten will utilize the customized shortened domain name with your branding. a) Download the YOURLs source code to your computer. b) Upload it to the main root directory of your blog or website. The easiest way is to use free ftp software such as Coreftp. c) Download the plugin as a zip file from the YOURLS website – simply Google YOURLS and you will see it. Upload the plugin to your WordPress blog and activate it. d) Enter the file path to the YOURS config.php file in the box that opens when you activate the plugin. You can now easily generate a short URL without depending on any external third party to maintain the short URL. There is also a version known as YOUR-Wordpress-to-Twitter that acts as a bridge between YOURLS and your blog. Whenever you publish a new post, YOURLS generates a short URL for it. Automatically tweet a post with short URL feature is disabled in latest version. a) Upload the source code as above. b) Select and register a short URL as described above for the Bit.ly method. Point the new DNS addresses your existing web hosting service, and then use your new shortened domain as an add-on domain to your main domain. This is easily done in CPanel. c) Create placeholder site in the root directory of your new short-name domain. e) Complete the installation by accessing http://yoursite.com/admin and following the instructions. URL shorteners such as YOURLS can convert long and complex domain names into short versions. When used in combination with the Bit.ly or YOURLS method to shorten a URL, your final short URL will be produced in a form that promotes your branding. You can select your own final short URL and have it registered so that only you can use it. URL shorteners are not only fun to use, but they can improve brand recognition. They look good and maintain your brand visibility even in Twitter tweets and other micro blogging systems where a longer URL would automatically be changed to a shorter unrecognizable form.